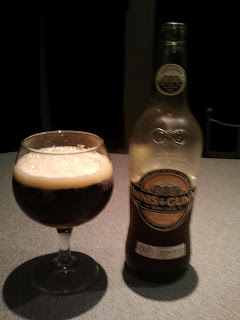 Black Metal and Brews: Beer Review: Innis & Gunn's "Rum Cask Oak Aged Beer"
Beer Review: Innis & Gunn's "Rum Cask Oak Aged Beer"
This beer is a sneaky one. The bottle is unassuming and modest. There's no flashy packaging, no absurdly high price tag. It's not made by a brewery actively riding the current craft beer craze with a hundred different drinks on the market. It's a simple and attractive bottle, explaining what the beer is and little else. That should be all this beer needs to sell itself, but it probably isn't. 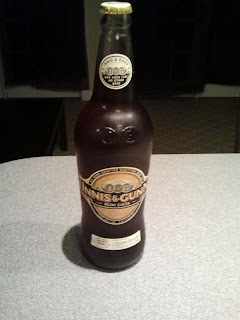 I was hesitant at first, but appearances are often deceiving, so I brought home this modest little monster from Innis & Gunn and I'm currently a very happy camper. The beer pours a pretty average head, which dissipates relatively quickly. Even the first sniff of this beer confused me. The aroma was almost reminiscent of many standard pilsner type beers, which I tend to find unexciting. While there's a certain faint, musty sweetness to the nose, it's pretty mellow and tame, which makes the flavor such a huge and wonderful surprise. My first sip was an oak-filled flavor explosion. So was my second. This beer in its simple bottle with its mild aroma has some of the biggest and most surprising flavor of any beer I've tried lately. The actual beer is full of caramel, raisin, and other sweetly intoxicating tastes. With each sip I feel like I'm peeling back another layer of this beer's medley of tastes. It's got a fair kick (7.4%) that you can definitely taste, and it's a malty, rich, and wonderful experience. What I expected to be a rather standard beer experience is quickly making its way onto my "will buy again" list. I encourage you to do the same. While many of the currently popular breweries are making bizarre and exciting beers with all sorts of peculiar names and labels, this is an incredibly well made beer with enough depth to dominate even the fiercest competition. If you find a bottle, grab it. I've had its non-rum cask cousin, which was quite good, but I definitely recommend spending the extra dollar or two for this gem.